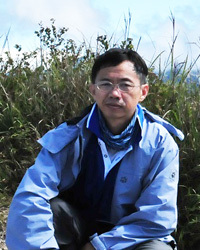 " Heng is devoted to the translation of the Cichlid Room Companion into Chinese "
Heng Kuang Liao, friends call him Fisher, is an aquarist in Taiwan, ROC. He has kept fish for over 20 years. His favorite fishes are Lake Tanganyika cichlids, especially the feather fins, such as Cyathopharynx and Ophthalmotilapia species. Besides keeping the cichlids from Lake Tanganyika, he has also translated many articles about cichlids from books or web sites since 2001. He would like to introduce some quality information for everyone who loves cichlids of Lake Tanganyika, so he is devoted to the translation of the Cichlid Room Companion into Chinese since 2011, hoping to make more people interesting in these fantastic cichlids. Heng has been keeping and breeding feather fin cichlids for the past years. He advocates setting a up natural decoration in the aquarium, making it look close to natural habitat. Because Heng is getting more and more information, in the last two years he has also develop an interested in American cichlids, enjoying cichlid jewels from American rivers.